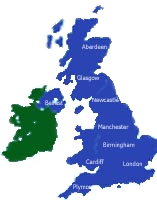 Fastspeed Couriers offer same day delivery to and from all parts of the UK. Fastspeed Same Day Couriers have vehicles waiting to carry out your urgent deliveries. Do you need a Same day Courier in London? or a Same day Courier in Manchester? or a Sameday Courier in Birmingham? or a Sameday Courier in Leeds? As part of the largest network of couriers in the UK we cover most jobs in most areas including all the major cities. We also have a working relationship with hundreds of other couriers across the UK.